US Housing data from October came in at their highest levels in ten years. High demand and limited supply are pushing housing prices higher this year. In August, housing prices in Denver, Miami, Houston and the Washington D.C. metro area hit levels that most consider being overvalued. Furthermore, now reports indicate that home prices on the lower end of the spectrum are rising faster than those in the middle and high end. Acute shortages of housing, especially in the low end of the market is causing prices in that tier to increase much faster than those in the middle or high-end tier. Many believe home prices are increasing because millennials are finally entering the housing market, which would certainly make sense when you consider the low end of the market, or starter homes, currently have the most demand. Prices will increase until either supply, as in the number of homes available for purchase, catches up with demand or prices hit a point that reduces demand. It is more likely the latter will occur first, due to the time required to build more homes and especially when we consider what is likely to continue happening with interest rates. The Federal Reserve has made it clear they plan to continue increasing interest rates for the next few years, and as rates rise, the cost of homeownership follows. Well in the future we are likely to see housing-related stocks perform reasonably well, which you can see my reasoning here and what you may want to buy. But, another area that may outperform is Real Estate Investment Trust’s that have exposure to the housing rental industry. If rising home prices continue to occur, REIT’s will continue to benefit in some ways. First off, as home prices rise, more people will be forced to rent as increasing prices push them out of the market for buying a home. That, in turn, will naturally increase the number of people who will need to remain renting, which keeps occupancy and prices high. Second, when single-family home prices, especially those on the low end of the market rise, rental rates can also increase. When thinking about housing, of course, there needs to be a value proposition of renting over buying, which is mainly the lower monthly costs. But renting doesn’t need to be super cheap about owning, just a little less expensive. Now let’s take a look at a few REIT Exchange Traded Funds that you can buy today. 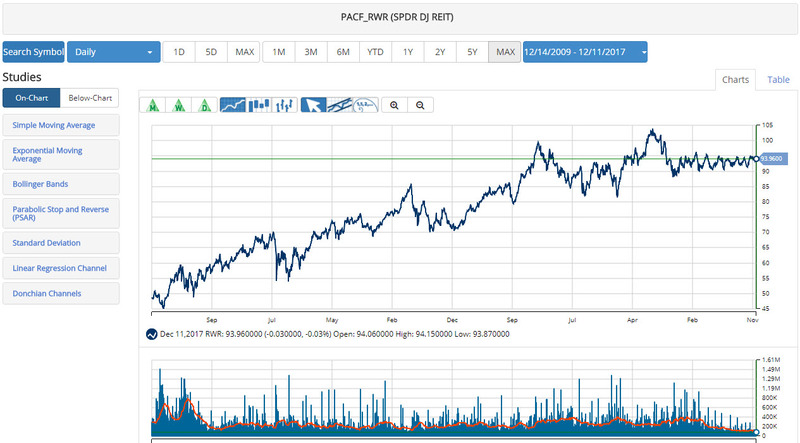 First, we have the SPDR Dow Jones REIT ETF (PACF:RWR). RWR is one of the oldest real estate ETF’s available with an inception date of April 23rd, 2001. That is important because it can give investors confidence that the fund will not likely fold anytime soon and because it shows RWR has gone through a boom/bust real estate cycle and survived. RWR is a diverse market-cap-weighted basket of US REIT’s with commercial REIT’s making up 51%, specialized REIT’s consisting of 26% and residential REIT’s accounting for 20% of the fund's assets. The fund currently has 102 different positions with the top 10 making up 40% of the fund. With most REIT’s, appreciation does not usually come from the price; it comes from the dividend. RWR is up just 3.17% year-to-date and up 7.08% over the last twelve months but offers a dividend yield of 3.94% while only charging an expense ratio of 0.25%. 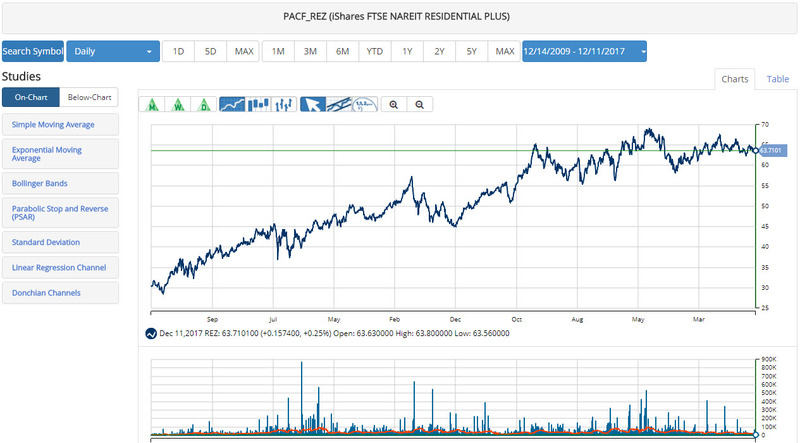 Next, we have the iShares Residential Real Estate Capped ETF (PACF:REZ). REZ is often thought of as a residential REIT, but the bulk of its top holdings are not residential REIT’s. Specialized REIT’s make up 50% of the fund, while residential make up 45% and its top 10 holdings represent 60% of assets. REZ also currently has just 45 holdings, as opposed to RWR’s much broader portfolio. Additionally, REZ offers a 4.74% dividend yield but charges 0.48% and has only been in existence since 2007. Finally, while RWR has $2.84 billion in assets under management, REZ has just $378 million. REZ’s performance though is better as it’s up 5.32% year-to-date and 11.97% over the last twelve months. 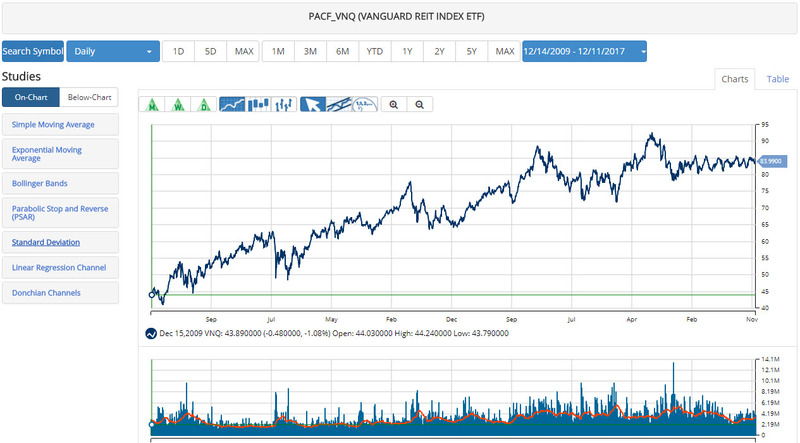 Finally, we have the Vanguard REIT ETF (PACF:VNQ) which has been around since 2004, has the lowest expense ratio of the three funds, at just 0.12%, and the most assets under management with $35.1 billion. The downside with VNQ is that if you are looking to use it to give you exposure to higher residential rental prices is that it only has 15% of its assets in residential REIT’s. 55% of assets are in commercial REIT’s, and another 26% are in specialized REIT’s. On the other hand, though it’s top ten holdings only represent 38% of assets, which is much lower than the other two ETF’s mentioned, but could be due to VNQ owning 153 different investments. Lastly, VNQ offers a 4.69% yield while increasing in value by 4.86% year-to-date and 9.7% over the last twelve months. As you may have noticed, none of the ETF’s mentioned above have been great performers regarding price appreciation. But, they all offer healthy distribution yields. Investors looking for income and a possible hedge against a market correction should be comfortable buying one of the ETF’s mentioned above. Disclosure: As of this writing, Matt Thalman did not own shares of any equity mentioned above. This article is the opinion of the contributor themselves. The above is a matter of opinion provided for general information purposes only and is not intended as investment advice. This contributor is not receiving compensation (other than from INO.com) for their opinion.